Enjoy the huge selection of the Cabo furniture style by North Cape International. Featured here is the chaise, which matches perfectly with the Cabo Dining Set, Day Lounger, Sectional Couch and more. Visually, the hallmark of the collection is the thin supportive legs with squared edges and the dark brown Jacobean flat weave resin wicker. The seats are cushioned with thick all-weather padding and wrapped in the world famous Sunbrella fabric that has the look and feel of an upscale indoor fabric. Also for comfort, the adjustable lounger sits upright for reading and sunbathing, and lays totally flat for catnaps and stargazing. 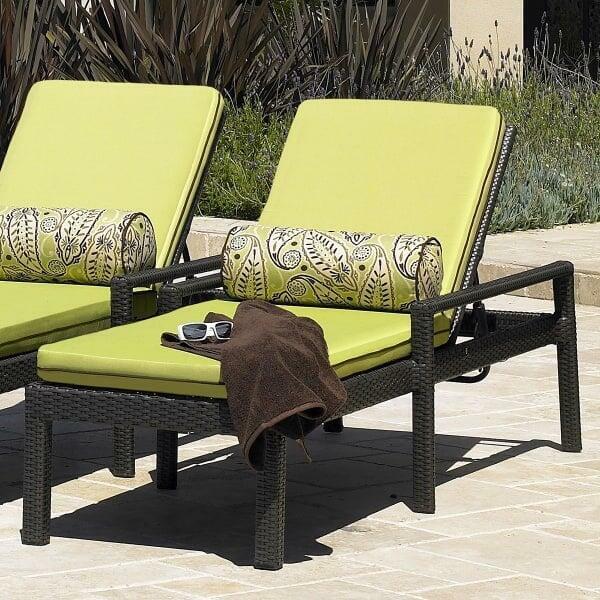 For style, choose the Sunbrella fabric pattern that best suits your patio furniture aesthetic. And, for reliability, the furniture is equipped with a sturdy rustproof aluminum frame, is totally weather-resistant, and may be cleaned off with mild soap and water.